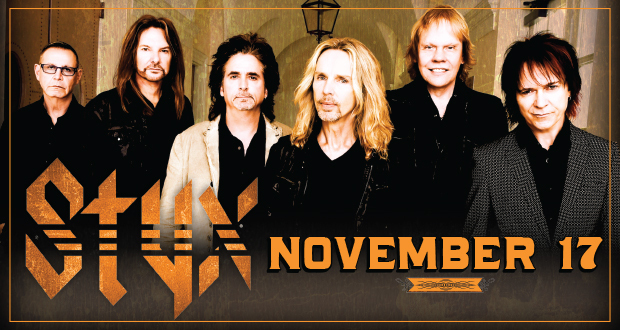 Winnipeg, MB: Styx, comprised of Tommy Shaw, James “JY” Young, Lawrence Gowan, Todd Sucherman, Ricky Phillips and Chuck Panozzo, will bring their 2015 tour to MTS Centre in Winnipeg on Tuesday, November 17, 2015. Tickets will go on-sale Friday, May 8 at 10:00 am through Ticketmaster. The men comprising Styx have committed to rocking the Paradise together with audiences far and wide by entering their second decade of averaging over 100 shows a year, and each one of them is committed to making the next show better than the last. Styx draws from over four decades of barnburning chart hits, joyous singalongs, and hard-driving deep cuts. Like a symphony that builds to a satisfying crescendo, a Styx set covers a wide range of stylistic cornerstones. From the progressively sweeping splendor that is “The Grand Illusion” to the hunker-down fortitude of all that is the “Blue Collar Man,” from the majestic spiritual love for a special “Lady” to the seething indictment of preening, primping pageantry for pageantry’s sake of “Miss America,” from an individual yearning for true connection as a “Man in the Wilderness” to a soul-deep quest to achieve what’s at the heart of one’s personal vision in “Crystal Ball,” from the regal reach-for-the-stars bravado of “Come Sail Away” to the grainy all-in gallop of that rugged “Renegade” who had it made, the band draws on an unlimited cache of ways to immerse one’s mind and body in their signature sound. After more than a decade together on the road, this incarnation of Styx is looking forward to performing as many shows as it can as long as it can. “It all comes back to the chemistry,” says bassist/vocalist Ricky Phillips. “The legacy of this band will be that it brought joy to millions of people,” notes drummer Todd Sucherman. Observes keyboardist/vocalist Lawrence Gowan, “We’ve always tried to explain why this is this happening. It’s obviously a multitude of factors, but the main one is that our show is really good! And if it’s really good, they’re going to come to see it again.” Styx hopes it’s a wave that never crests. “Every night, we go on that magic carpet ride together,” observes original bassist Chuck Panozzo, who joins the band on tour as often as he can. “Music is this amazing force that comes from a higher place. I’m humbled for this band to have the great success that it has,” says co-founding guitarist/vocalist James “JY” Young. “We just want to keep on doing this,” asserts Tommy. “We want to let life take its course and let this music continue to be the soundtrack to it. And this band will continue to evolve as long as we live and play this music.” The jig is up, the news is out: The Esprit de Styx is alive and well, and now it’s time to see for yourself. Welcome to the Grand Evolution.